When you arrived at this point in the review – and I’m sure you did, this is the first sentence – you might already be wondering: why is there no score for this game? There is no mystery about it: I don’t want to rate it and maybe discourage you from buying because Old Men of the Forest is a card game for charity. Specifically, all profit made from Old Man of the Forest go to the Orangutan Foundation UK, the foundation for which Sir Terry Pratchett is a trustee. Sir Terry is known to have a soft spot for the asian great apes, one of the most popular characters in his Discworld novels is an orangutan, although not by birth. When Martin Wallace created Discworld: Ankh-Morpork based on Pterry’s setting, making Old Men of the Forest was a perfect match for further cooperation. Wallace’s name stands for deep, complex and strategic games like Age of Steam or Automobile. If that’s what you’re looking for then Old Men of the Forest will be a disappointment, it’s neither complex nor very strategic, it’s a rather light card game. But for a game for charity making it lighter and, maybe more importantly, cheaper is the better option – many more people will spend some bucks for a card game for the apes than a whole lot of bucks for a big box of strategy. What is this light card game about, then? Each player receives a hand of cards with values from one to ten belonging to one of five suits. One by one, players play one card but don’t have to follow suit. Then the player who played the highest card picks any of the other cards and puts it to his side, then the second player does the same. After claiming a card this way, you have the chance to buy an orangutan card. Four or five of these cards are always available in the center of the table. They all have a victory point value and a price. The price is in cards of specific suits – two dollar cards, one jeep and one banana, always from one to three cards. 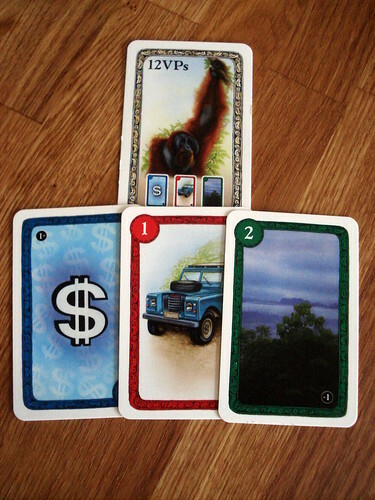 When paying the price, you’ll want not to have cards left over: all cards you don’t use to pay are kept under the orangutan card and will score negative at the end of the game. Regular cards score -1, deforestation cards score -2 and are never needed to pay for cards, so once you’re forced to pick them, you’re stuck with them. After playing the 10 cards of a hand, the game ends and points are totalled. As I said, the game is light, there is not nearly as much strategy involved as you’d expect from a Martin Wallace game. You’ll want to count cards a little and keep an eye on what the others are collecting – having a card bought away under your nose just before you can get it leaves you with cards that may now be useless and bring down your score. But that’s it with strategy. On the other hand, you depend a lot on your card values. Missing high cards you can be sure you won’t score in this hand. Having only mediocre cards may be even worse as you often end up taking deforestation cards when your card is the second highest. In four players, this isn’t as big a problem as even the second player has two or three options to choose from. In three players, having the middle card leaves you no options and you often end up hurting yourself with the card you have to pick. The game’s illustrations by Mike Atkinson range from beautiful, especially the orangutan cards, to bland for some of the suit cards, the dollar suit comes to mind. I’m not unhappy with the artwork, but in a game for charity for orangutans I wanted more than three different ape motifs on the 16 orangutan cards. If Old Men of the Forest sounds like your kind of game, or if you simply want to support the men of the forest – the meaning of orang utan in Malay – then you can get the game straight from Treefrog and be sure that the profit from your order will benefit the apes.